As some of you are no doubt aware, I can get kind of geeky about uniforms. If you didn't know that personally, the link to UniWatch might have given it away. Baseball is my favorite to discuss, probably due to it being the sport with the richest history, and being my favorite sport. So, allow me to geek out a little today. Today's post started last night with a bit of a disheartening moment. I was watching the Cubs lose to the Rockies, but in a rare bright spot, Reed Johnson* came to bat and was sporting some stirrups. That shot is not from last night, apparently this is not new thing for him. But, he wears some pretty small openings, so I think I'd just manage to miss it until know. I also might have been a little more alert to look for it, because Darwin Barney has also been rockin' 'rups. I pointed that out to Kristine (my fiance, for those not in the know), and she didn't know what stirrups were. Outside of horse riding, anyway. I was a little crushed. *Reed Johnson seems like the kind of player you don't really appreciate until he plays for your team and you see all the little things he does. I can tell you I got way too excited to see him back in a Cubs uniform for a player of his skill level. 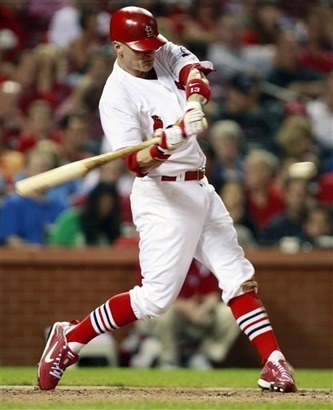 He's a solid player, sure, but I was excited like we'd signed Pujols or somebody. 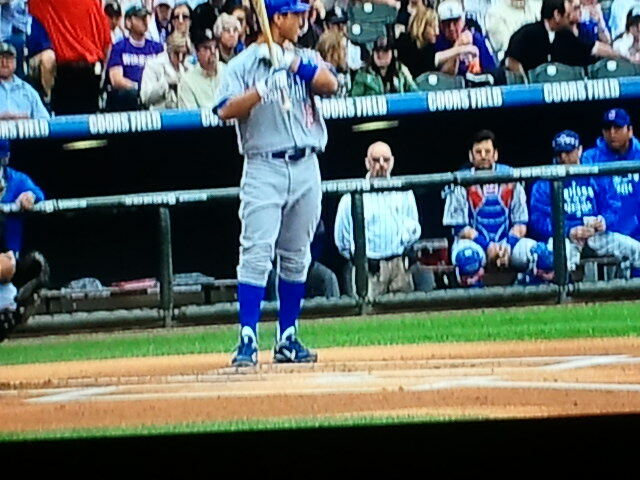 I can't tell if stirrups are a dying breed, or trying to make a comeback. In addition to the Cubs mentioned earlier, Ubaldo Jimenez, Juan Pierre, and DJ Carrasco are notable stirrup supporters. 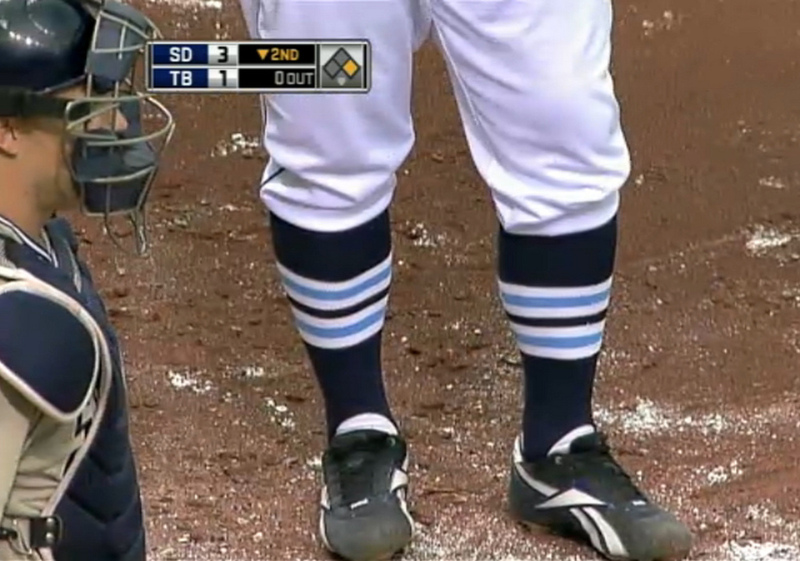 In the last year or two, the Tampa Bay Rays have adopted some St. Louis-inspired hosiery. And if anybody caught the Dodgers-Braves throwback game, it was hard not to marvel at just how good the Braves looked. And I generally like the Braves current uniform, but I would love to see them adopt the throwback full-time. The difference? Stirrups! If I'm not on record already, I would love to see MLB mandate stirrups. Other sports have rules regarding uniforms, and baseball does as well. 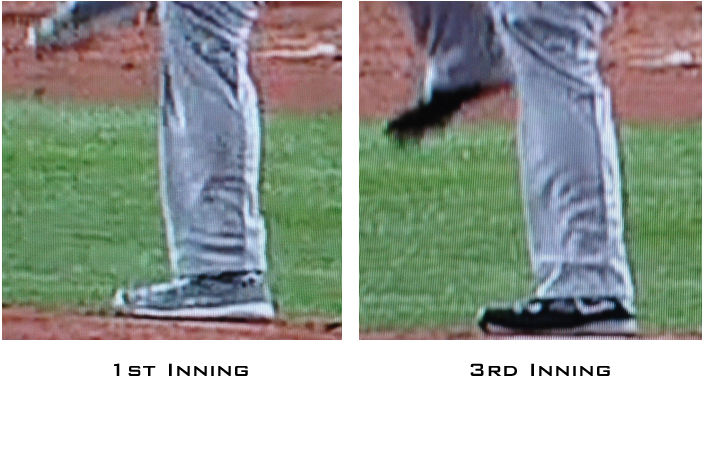 You might recall CC Sabathia having to change his shoes in last year's opener because grey wasn't an approved color. If that can be enforced, so can stirrups. If I ever get to do any high school or college coaching, my teams are wearing stirrups. I feel like I should come clean here. I hated stirrups when I was younger. We got them in my younger Little League days, and I refused to wear them by the end of the year. The problem, though, is they were ribbon stirrups. 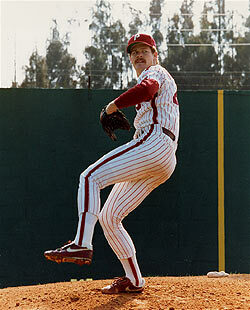 Which I still don't like to this day, and for a long time those were the only stirrups I knew of. When I learned about real stirrups, though, I feel like I really missed an opportunity, at least in high school. I don't remember if our socks (which were solid black) were issued to us, and I always went high-cuffed. I would've totally rocked some stirrups if I could do it again. Oh well. There's always slow-pitch softball when I find another team to play on.